I am passionate about eliminating food waste and reducing how much food packaging comes into my house. I don’t post about it much because others cover it so well in their blogs! As you know, I am an avid coffee drinker. I have very few Big Vices and I will not give up caffeine. I did make one major adjustment. I was drinking coffee all day long, so I switched to half-caff on weekdays. I usually make myself two espresso drinks at home on Saturdays, and one on Sundays. Most of my coffee drinker friends have Tassimo or Keurig coffee machines. For those who don’t know them, you buy a brand name coffee machine, and then you commit to buying individually-packaged servings of coffee that are branded for that machine. You generally buy 12 or 24 coffee servings in a box. The key selling points of these “coffee systems” are that you get the taste of brewed coffee instantly, you can have a different blend or a different flavour every time you make a cup, each family member can choose their own favourite, and there is no clean-up. When you’ve brewed your cup of coffee, you just throw out the K-Cup. If you were accustomed to making a pot of coffee in the morning and you regularly threw half of it out, then making it by the cup in a Keurig or Tassimo might be slightly less wasteful. But so would any single-serving coffee maker. I think offices like them because everyone can bring their own coffee cuplets and no one is stuck with the mess. You have probably guessed by now that I will never own one, even though I am a huge coffee fiend. First of all, there is the cost. In my area, a package of 12 Keurig K-Cups costs, at best, $7.99. If you haven’t already worked it out in your head, that is $0.66 per cup – for coffee you make at home! I discovered that a K-Cup contains about 10 grams, or 2 tablespoons, of coffee. By comparison, I get a 1 kg bag of fair-trade coffee for $15.99 at Costco, and I also use 2 tablespoons in my single-serving French press coffee maker. Therefore I get 100 cups (16 oz mugs, actually) for $0.16 each. 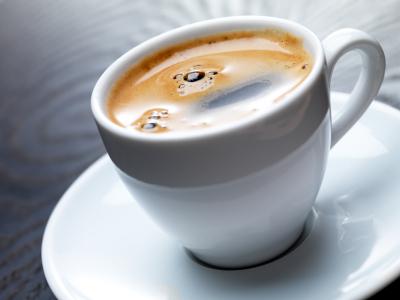 I use the same coffee ratio in my drip coffee maker – 6 tablespoons makes 3 sixteen-oz. mugs of coffee. I buy inexpensive store-brand espresso, and also use 2 tablespoons for a 2-ounce serving (adding milk or water to make a latte or an Americano). It costs me $0.18 per serving, plus the milk. The only plus about the cost of K-Cups is that they’re cheaper than a take-out coffee from Tim’s! Next, there is the waste. Each Keurig K-Cup or Tassimo T-Disc is made of plastic with a paper filter inside and a foil lid (and a shot of nitrogen to keep the coffee fresh). You throw the whole thing away. They are essentially non-recyclable because of the mixed materials. There is no clean-up, though, and I’m sure that’s a major part of the appeal. Sounds tedious, eh? I think I can handle it. You can now get refillable K-Cup replacements, i.e., you can put your own coffee in them! That makes much more sense to me. But of course you would have to clean them after every use! Another thing to think about is the hot water in the Keurig machine going through the plastic K-Cup into your coffee mug. Heat and plastic are not a good combination for ingesting, either in a Keurig machine or most cheap drip coffee makers. I hope it won’t be long before there is a collective “a-ha moment” about coffee cuplets and they are suddenly seen in the same light as bottled water. It probably won’t surprise you that I don’t prefer the taste of cuplet coffee either, no matter what the brand or blend. It makes a good attempt to taste like real coffee, but because it is brewed in 45 seconds, it doesn’t have time to develop, like richer coffee-brewing methods. Bring a travel mug for the car, meetings, hockey games, etc. When North Americans travel to Europe, we notice that no one walks around or drives in cars with paper cups of coffee. When you pay your $3.50 for a cuppa, you sit back and savour your time in the café before getting on with your day. You feel the weight of the mug in your hand, and you enjoy the conversation, the music, or the quiet. I have recently cut back on coffee a little bit, not because I have any fears about it, but because I want to slow down and enjoy it more mindfully. What is your coffee story? I don’t drink coffee at all – I love the smell of it, but can’t stand the taste. I much prefer tea, and try to stick to loose tea made in a pot or in my travel press cup. My husband drinks coffee though, and at one point in time I briefly wished he’d switch to a Keurig simply for the easy clean-up, since he makes a huge mess every day with grounds all over the cupboard and spilled coffee. Then he pointed out the waste to me and I moved over to your camp with the no-waste thing. Fortunately, he brews his coffee in a french press even for regular coffee, and we either buy beans that he grinds himself, or the big cans of pre-ground at Superstore (which I then re-use as craft supply storage), so we end up with little to no waste except the grounds, which are biodegradable. I can totally understand why some people don’t like coffee. So bitter! Very much an acquired taste. I think I like the contrast between the strong coffee taste and the other foods I eat, whether they are toast or cookies! Whereas the milder taste of tea (other than chai) tends to blend in with what you are eating. I do like tea to warm up with, though! I really do understand the appeal of the Keurig machines, especially when there are people at home who don’t clean up after themselves! I buy coffee the same way you do. Thank you for this post! The BF would like a coffee machine for our home, and I’m willing to get him/us one for Christmas once I can work out where it’ll sit out my way! I like those clean benches. Interestingly, I’d assumed he wanted a pod machine, and I was attracted to them. When I started discussing features over the weekend, I mentioned that I thought pods was out of line with my priorities, even though I was drawn to them. I was surprised he thought a pod machine was no good (I thought he’d love the ease). I’m not sure where that leaves us. I know my biggest ‘want’ is a milk frother, which I know can be bought separately! So it’s really up to him what we end up with. One bonus will be that he will use less single use cups – he never really took to my ‘gift’ of a keep cup (partly it was too tall for most commercial machines, so I’m now freecycyling it so it will get use). Ah, I think your answer depends on what kind of coffee he likes. If he drinks dark roast, you can get any kind of coffee maker that suits you. If he drinks espresso only, then you know you need an espresso maker, electric or stovetop. 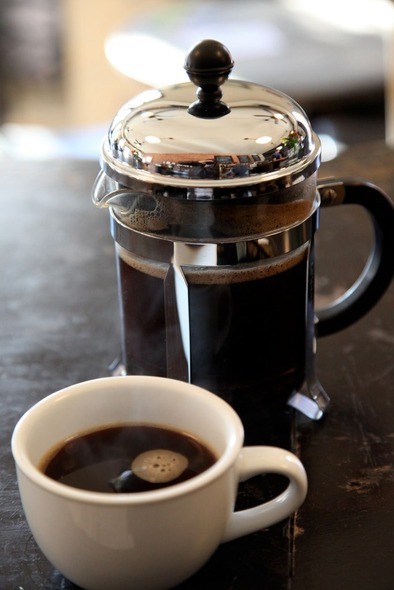 French presses are really only good for dark, full-bodied coffee. Drip machines can do a good job on light and medium blends. Clean-up might make a difference too. You can get permanent filters for drip machines (some made with plastic and some with metal mesh) or you can use unbleached paper filters. Either way, they’re easy to clean up. French presses and espresso machines are both a bit more fiddly. Paper filters filter out the oils from the coffee, which may be good or bad depending on your tastes. I was up to 5-7 cups a day but have just switched to decaf because of sleep issues (it made a difference!) It is the ultimate enjoyment to have real coffee in a real cafe with something to read! Well, I was drinking 3 sixteen-ounce cups a day, so drinking half-caff brings me down to 3 eight-ounce cups a day 🙂 I think it’s a good idea for everyone to cut back on coffee occasionally to see what their tolerances and sensitivities are for caffeine. I will drink instant as a stop-gap when there is no other coffee to be found! I like coffee at a cafe too because of the relaxation time. I’m not a big coffee drinker. I usually only indulge in the winter time and/or when I have a migraine like I do today (caffeine helps abort them). Plus… I seldom buy milk or cream, and I won’t drink coffee without it – so it’s really only something I have when all the stars align. well, since I usually drink green tea, it would probably make more sense for me to switch to loose tea instead of bagged rather than investing in a rarely used coffee system! I drink some tea as well and I’m in the process of using up all my tea bags so I can switch to loose! 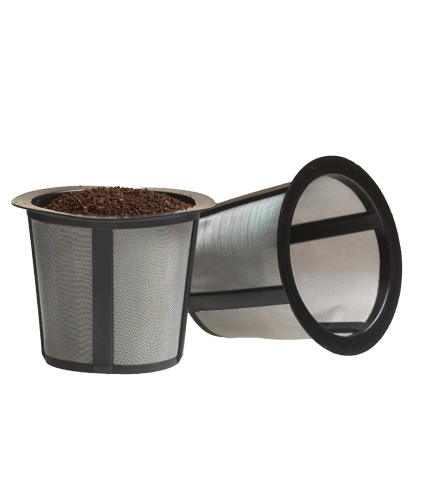 I think you can get metal-mesh reusable filters, but it doesn’t sound critical when you don’t drink much coffee. A coffee free house here. We drink tea. On weekends I make a pot for breakfast with loose leaf but normally we use tea bags. We buy tea bags with tea grown in Australia, to minimise travel miles and resulting carbon footprint. Also we know this tea is grown without herbicides. Only plastic is the wrap around the box.mu loose leaf comes from a shop that buys in bulk and weighs out desired amounts from a tin into a foil and plastic bag. I think I will find out if I can buy straight into my own tin, so there is no waste. Excellent! That is commendable. I like tea and usually have one cup a day, using tea bags. Although I did buy a local brand, it was sold to a multinational. But tea is certainly not grown anywhere near here! I am trying to run out of tea bags and switch over to loose. I buy organic fair trade coffee, sometimes at Costco and occasionally from a local roaster as funds permit. Oh, and I agree with you about the pods. So wasteful. And who wants your coffee filtered through plastic. I love coffee and have been tempted by a N’esppresso machine but the cost of the pods is offputting. Last Christmas I got an Aeropress which is fantastic and about quarter of the cost of a Tassimo machine. The big plus is it uses normal ground coffee. I haven’t heard of Aeropress so I went to their website just now and watched their video. One of our local coffee shops uses a commercial version of it – they described it to me as an upside-down French press. They make fantastic coffee! Thanks for commenting – this sounds like a good option. I don’t drink coffee or tea, but Mr. G likes a cup of coffee before he leaves for work. We have a stainless steel French Press and he drinks it out of a ceramic mug or stainless steel travel cup, but we still have to buy the actual coffee in a plastic bag – it’s not sold in bulk anywhere around here. He wanted a Keurig and I wanted the French Press, so the compromise was that I clean the press for him. 🙂 Is your press glass like the one in the picture? I just wonder if it’d be cool to watch. I do have a glass French press – I thought they all were! Funny, I do kinda like watching it! I buy some coffee in plastic bags, so I buy the largest packages available – it will definitely get used! I’m definitely a coffee lover and we use locally roasted coffee beans to make it in a French Press. I drink 2 to 4 cups a day depending on how my energy level is doing LOL. I do love going to our local coffee house but not the expense so I am trying to find other ways to get out of the house. By the way, I simply rinse the coffee grounds out of the press and pour them through a small kitchen strainer in the sink. When they have drained we dump them in the trash. That way the press only has to be washed in the dishwasher once a day. You sound like a coffee consumer in my league 🙂 I just scrape the grounds out of the French press with a spatula (into the compost container) and rinse it under the tap, so it’s a minimal effort, too. I’m another one who doesn’t drink coffee. I will very occasionally buy one when I’m out, but I’ve never had coffee in the cupboard at home. I do drink green tea once or twice a week at work, so I keep a ceramic mug and a box of teabags at my desk. My dad uses a moka pot (http://en.wikipedia.org/wiki/Moka_pot) to make his coffee. Have you ever tried that? You have taught me something new! I have never used a moka pot but I always referred to them as stovetop espresso makers. Now I know that they don’t make “official” espresso, although I bet they’re mostly interchangable. Thanks! I have a dripping system, which I got for my birthday last year. My parents could give it to me, because it was in discount, 30€ instead of 60€. When I see that the coffee machines with cups (we have Nespresso here…) cost at least tenfold of what my system costed now, and often more than tenfold of the original price, it is not only the cups that make it a costly kind of coffee. Oh, and I have an espresso pot, which makes lovely coffee too, and which costed only 5€. Both of those systems make way better coffee than those cup-machines, so I really don’t know why people pay so much money for those! Well, perhaps it is, because it’s the fad of the day. We also have a Senseo-machine, which, I believe, was never sold outside of the Netherlands. The coffee does not taste bad, but is not as nice as the other kinds of coffee by far in my opinion. Fiancé still things otherwise, and sometimes it is easy to use, but I hardly ever use it. Mostly for the same reasons: the pads are not re-useable, and the re-useable thing is way harder to clean than the ‘normal’ coffee systems. You sound like a serious coffee drinker! 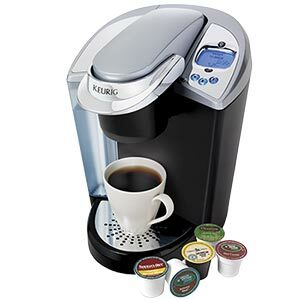 Here too, a Keurig coffee maker costs 4-6 x or more what a drip coffee maker costs. I don’t buy coffee away from home much either – maybe once a month? I like our local coffee shop that uses a French press and makes “single bean” specialty coffees that have distinct tastes (not a blend). Senseo sounds familiar. I wonder if it was sold here in Australia. I don’t drink coffee, but I love to make it for my husband. He likes a soy caramel latte. I grind locally roasted beans, making the coffee in a three-cup moka pot (he generally has only one coffee a day!) I froth some barista soy milk and assemble it all in what we call a Betty Blue cup. I’m not sure if that is a common term. We got the name from a coffee shop back home. It has about a two-mug capacity and looks like a bowl with a handle. It gives him a real kick start in the morning! I love those big bowl mugs; it feels good to wrap your hands around them and know your coffee will last for an hour 🙂 I like the ritual of making coffee, too. Umm, for myself, that is – my spouse does not do any caffeine at all – just herbal tea and chicory drinks! Totally agree about pod coffee,alers. plus ive never found the coffee strong enough for me. I like the froufrou coffee mixes at coffee shops, but I’m too cheap to buy them often (maybe 2-3x per year). Heavens knows I don’t need the calories either. I make drip coffee every day and fill up a travel mug and thermos to bring to work with me. The thermos works great, it keeps coffee hot until the afternoon if it lasts that long. I have a French press too, but rarely use it anymore because I find cleaning it painful and because I like my coffee steaming hot and it cools too quickly in the French press for me. Fr the drip machine, I use unable ached paper filters and throw it plus the grounds in the compost so it doesn’t feel too wasteful. On work days, I do the same thing – make a pot of drip coffee and bring a thermos to work. When I’m home I tend to make coffee by the cup but it does mean a lot of clean-up! Thank you so much for bringing to my attention about making coffee in cheap plastic coffee makers. I never thought about that and immediately moved it out to the garage and put the Chemex and French press back on my counter. I would never buy a Keurig for the reasons you mentioned and now won’t use my Mr Coffee anymore either. I have given up my plastic drip coffee maker too because nothing on it says it’s BPA-free, and even then, I don’t think plastic and heat are a good mix. I am using my French press and espresso maker more, but debating whether to buy a drip coffee maker with a stainless steel interior. I am very glad he is not interested in the Keurig gadgets because I would not tolerate the waste. As I said, I drink tea, which I usually order loose in bags from The Granville Island Tea Company in BC. I only wish I could cut back on the sugar I put in the tea! PS. Now you’ve got me wanting to figure out how much his coffee costs per cup! No special roaster…yet. He roasts small batches in a couple of old hot air popcorn makers he picked up from Goodwill and a yard sale. They have to be a certain kind. I think if you google it, instructions will come up. Apparently, they roast coffee well. The smell is something else close up so he does it out in the drive shed – I wouldn’t advise an indoor oven because of the intense smell that will fill your house! I love the smell of coffee but have never developed a taste for it – I think I am missing out! I have a very bad sweet tooth (teeth really) – my intake is more than just my tea. Do you worry about your sugar intake? Well, no. Maybe I should. I am relatively fit and a good weight. I also eats tons of healthy foods. I hope it doesn’t catch up with me! There is no coffee story here. Paradoxically enough, I am the offspring of passionate coffee drinkers. Plus, my boyfriend is addicted to coffee but he has really reduced the consumption due to health issues. Concerning me, I do enjoy green tea instead but once/twice a year a cup of Greek (originally Turkish) coffee too, with my beloved grand-mother. The amusing part is that her tasseographic skills (telling the future by reading the coffee cup) are still unbeatable even though, I never remember the predictions to compare-lol! It would be interesting to know if other people’s coffee drinking turned you off it! Wow, Greek and Turkish coffee is the ultimate coffee bravery experience – with or without knowing your future, LOL! I guess I am co-addicted with the coffee and candy thing! Good idea! Read your posts, too!